The term industrial strategy might well conjure up thoughts of factories and mines—seemingly the antithesis of our modern economy—or, perhaps, memories of the economic stagnation of the 1970s and even the Winter of Discontent. So when Prime Minister Theresa May—whose party ushered in a different approach to the economy in 1979—announced the creation of an industrial strategy in 2016, the move seemed significant. But more than that, it was widely welcomed by UK industry. Following the publication of a follow-up white paper on the strategy in November 2017, it was seen as a “big first step” by the Institute of Directors. However, the UK business organisation emphasised that it must be possible for subsequent governments to follow through with the plan. Other commentators, meanwhile, fearing that political winds could lead to a change in focus, are suggesting the need for an independent body to monitor progress. Against a backdrop of austerity and a forecast for weaker growth, it is not certain whether the figures mentioned in the strategy would be sufficient to have a real impact. 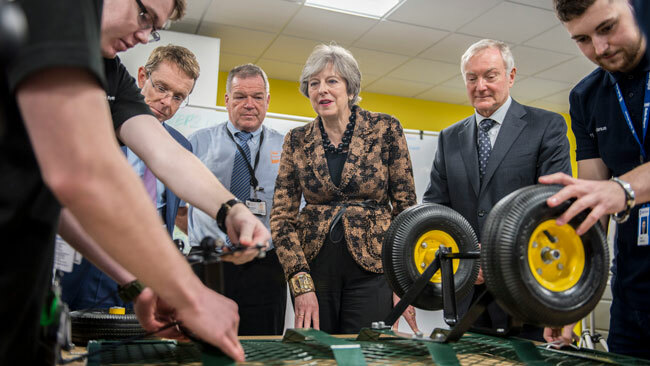 Prime Minister Theresa May visited the EEF Technology Hub in Birmingham in November ahead of the publication of the industrial strategy white paper. Since the 18th century, industries have been developed and protected under the umbrella of industrial policies, including those on tax; industry regulations; investment in research; education and infrastructure, and partnerships between public and private entities. During the post-WW II years, when Japan experienced a so-called economic miracle, the powerful Ministry of International Trade and Industry was widely praised by some Western commentators as an example of how the state could play a beneficial role in directing the economy, as was being done in other countries. But in the 1980s UK, then-Prime Minister Margaret Thatcher focused on the privatisation of state utilities and the reform of trade unions, while encouraging foreign direct investment. Increasingly, the UK’s post-war consensus on heavy state involvement in the economy fell outside of the mainstream of political thinking. Today, the Japanese government’s Society 5.0 initiative focuses on robotics, artificial intelligence (AI) and the Internet of Things (IoT), as it faces demographic change and economic challenges. Other countries are also forging ahead with their own industrial strategies. The Made in China 2025 (MIC2025) initiative, for example, seeks to upgrade the quality and consistency of Chinese manufacturing using the latest in technological advances. Germany, meanwhile, is pursuing an Industry 4.0 Strategy, which has had a major influence on MIC2025. Industrial policies and strategies are often sparked by market failures and the need to correct them through state intervention. But in the UK, the Brexit vote in June 2016 has focused minds on boosting exports and becoming more competitive globally. As the white paper states, “As we leave the European Union (EU) we need to raise our game at home and on the world stage”. May has added further impetus to what is one of her signature policies by renaming the government’s Department for Business, Innovation and Skills—it is now called the Department for Business, Energy and Industrial Strategy (BEIS). With that change, higher education and skills policy was moved to the Department for Education, while energy and climate change was brought in. The strategy, which is intended to address the country’s long-term economic challenges, improve living standards and increase economic growth, is being guided by the so-called four grand challenges: growing the AI and data-driven economy; achieving clean growth; preparing for mobility of the future; and tackling issues surrounding an ageing society. Further, the government aims to create an economy that boosts productivity and earning power using five foundations: ideas, people, infrastructure, business environment and places. These will be implemented in tandem with the four grand challenges. Some of the key policies include what are know as sector deals, or partnerships between government and industry. These will see an increase in total research and development investment equivalent to 2.4% of GDP by 2027; investment of an additional £406mn for maths, digital and technical education; support for electric vehicles through a £400mn investment in charging infrastructure; and the provision of £42mn for a teacher development premium. This will test the impact of a £1,000 budget for the development of teachers working in areas that have fallen behind. “The real significance of the white paper seems to be that the UK government is very publicly stating that it has a role to play in promoting new industrial opportunities in partnership with the private sector”, suggested Alexander Wellsteed, an independent consultant at Alternative Asset Investment Advisors. Wellsteed added, “While much of the report is focused on attracting inward investment into the UK, British industrial research and product innovation in areas such as cyber security, driverless vehicles and expertise in low carbon technologies could find new partnerships and ready markets here in Japan”. Innovative UK university research in other areas, Wellsteed believes, should be better pro­moted in Japan. He mentioned AI, stem cells, aerospace engineering and pharmaceuticals as crucial sectors. The first UK–Japan Industrial Policy Dialogue was chaired by (back row) Alex Chisholm, the UK’s permanent secretary for the Department for Business, Energy and Industrial Strategy, and Masaki Ogushi, Japan’s parliamentary vice-minister of Economy, Trade and Industry. What might this all mean in a UK–Japan context? The aerospace and defence industries will receive £725mn in funding to sustain research and devel­op­ment (R&D) programmes, and Rolls-Royce Japan Co., Ltd. also expects to see benefits from the strategy’s focus on education. “We would also see benefits from renewed vigour and a focus on building skills, enabling people to do more complex work in the future”, according to Haruhiko Tsuyukubo, the firm’s president and country director for Japan. “A way to take this to the next level is to support UK–Japan mid-career industrial exchanges to provide opportunities for cross-industrial and managerial experiences, encouraging participants from the UK and Japanese aerospace industries to be supporters and drivers for future collaboration”. Meanwhile, representatives of the British Embassy Tokyo said in a statement, “Increasing productivity through sector deals will increase the competitive edge of UK firms in the Japanese market, and this will be strengthened further by the aim to drive over £20bn of investment into innovative and high-potential businesses”. In addition, discussions on the implications of the strategy have been held at the highest levels of government. On 8 February, May met with senior representatives of Japanese firms in the UK and emphasised the opportunities presented by the industrial strategy. And in December, Japan’s Ministry for Economy, Trade and Industry and BEIS held the first UK–Japan Industrial Policy Dialogue. The discussions covered opportunities that could arise from the proposed industrial strategy, including shared challenges in productivity and demographic changes. The meetings have also identified areas for further bilateral collaboration, such as in areas related to space, aviation, energy, climate change, advanced manufacturing and the bio-economy. These discussions are being held at the same time as those of the new bilateral Trade and Investment Working Group, which is intended to develop a new economic relationship between the UK and Japan as the UK leaves the EU. 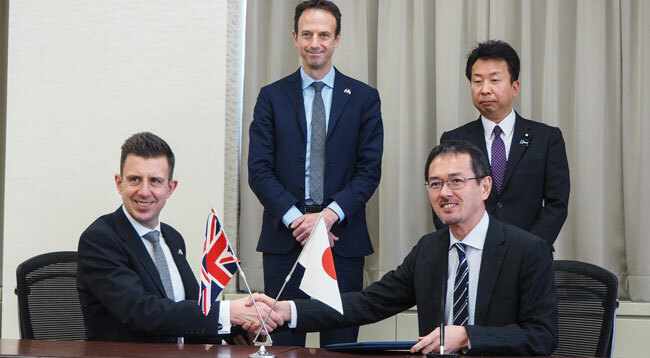 The British Embassy Tokyo emphasised the opportunity for partnerships between the UK and Japan, particularly for Japanese businesses, researchers, innovators and institutions spurred by new funding for innovation programmes and advanced R&D. “The crucial nature of Japanese firms for key industries puts them in a vital position to contribute to the new industrial strategy sector deals between government and industry”. Stobbs advised that, “Japanese firms may do well to predict what local and national opportunities will result from investment in the five foundations of productivity (ideas, people, infrastructure, business environment and places), as well as those that arise from addressing the four grand challenges”. Outlined in the white paper is the impor­tance of foreign direct investment (FDI) for the future of the UK economy. “The strategy highlights the importance of FDI in sectors, specifically noting Japanese investment in automotive in the UK, and the potential balance between EU and non-EU sources, noting that over 80% of world growth in the future is forecast to be non-EU”, Stobbs said. Also relevant to Japanese investment in the UK is the government’s new Industrial Strategy Challenge Fund, which is part of a £4.7bn increase in R&D spending over 4 years. “We expect Japanese companies to be actively involved in some of projects bidding for this fund increasing the strength of its partnership with the UK in commercialising new innovation,” the embassy said. In particular, they expect to see the UK’s position as a global leader on fintech strengthened by the strategy, with a rise in the number of UK fintech startups operating in Japan. As Stobbs notes, the strategy is not to be seen as a strict blueprint, but rather a guiding document. “It is as much about identifying the challenges to growing and diversifying the UK economy as setting out milestones towards a specific end point”, he said. Of these hurdles, he names clean growth and the country’s ageing society as top of the list. Another challenge is how to deal with the UK’s anaemic productivity figures, a point addressed by the five foundations of productivity. But the greatest challenge might be what spurred the industrial strategy in the first place. Since the Brexit referendum, questions have been raised about the attractiveness of the UK as an industrial base for Japanese firms. However, the British Embassy Tokyo says, “The industrial strategy gives Japanese partners clarity on how the UK will build on, and invest in, its industrial and technological strengths and extend them into the future”. Nonetheless, others consider the timing to be unfortunate. “It is too bad the policy has to take a back seat to Brexit”, said Sahoko Kaji, professor of economics at Keio University. “I thought that May correctly understood that part of the reason why people voted for Brexit was because they felt left behind. Her emphasis on education reform and industrial policy pointed in the right direction. But everything depends on how the Brexit process evolves, and the uncertainty over this process refuses to decrease”. In that context, trade and investment partners, such as Japan, might be unsure how to act. “The threat of uncertainty arising from the relationship between the UK and EU is one that has been felt acutely in Japan”, Stobbs explained. “The whole industrial strategy points to the government aiming to stimulate the necessary conditions for a diverse industrial profile for the UK, including R&D, manufacturing, infrastructure and services, in the face of what will inevitably be the significant disruption of Brexit”. To keep the industrial strategy on track over the long term, Wellsteed says that targets will need to be set and measured. If that can be achieved in a UK–Japan context, it is Japanese firms that look to benefit the most over the short and mid term. And if the strategy’s aims can be realised, UK firms will become much more competitive not just in Japan, but globally.